Did you hear that Southern California has a lot of breweries? Did you hear it has a lot of traffic? Well then, the only logical conclusion would be to plan a trip to drink beer and to travel by train. Here is your ultimate guide to beer in So Cal, and how to leisurely experience it all by train. The Intercontinental San Diego is brand new, right in the thick of a redeveloping section of San Diego’s waterfront, a one-mile walk to the Gaslamp District and easy access to the Coronado Ferry. With introductory rates available for less than $200 a night, it’s a luxurious and affordable landing spot to kick off your adventure. If you’re looking to chill on your first night, try Vistal, the hotel’s restaurant, for local beer and dumplings. Lay low and take it easy after the travel day, but don’t slack off entirely. Eppig Biergarten: Eppig’s first location is in North Park, and they recently opened a second location along the waterfront. The tasting room is open-aired and located right in the harbor, the view dominated by boats in the foreground and the city skyline in the background. The brewery specializes in German lagers, which go down nice and easy during the sunset. Mission Brewery: One of the most historic craft breweries in San Diego, Mission Brewery is worth a stop for its magnificent tap room alone. Built into an old Wonderbread factory, the space has an early 20th-century vibe with its high warehouse beamed ceiling, metal chandeliers, manhole covers, black wood, and tables made of beer barrels. Wake up and get in a morning workout. A big day of craft beer awaits. San Diego is one of the best cities in the States for craft beer, and the only trouble you’ll have is finding time to do it justice. 30th Street Beer Tour: Running through the neighborhoods of Normal Heights, North Park, and South Park, 30th Street is your straight shot to a variety of craft beer stops, a mix of tasting rooms, restaurants, and beer bars. Check out all there is to see with this suggested itinerary. North Park Neighborhood: If you’re a person who wants to visit a lot of breweries in a short amount of time, North Park is the place to be. It is riddled with craft breweries, including Belching Beaver, Mike Hess, Modern Times, Second Chance, Thorn Street, and a bunch of others. The train ride from San Diego to Encinitas is about 45 minutes via the Coaster train. Plan on departing mid-morning. Get on at the Santa Fe Depot, just a block from the Intercontinental. Get off at the Encinitas Station in the center of town. The Surfhouse is a small, eight-room boutique hotel along Highway 101, conveniently located next to a local coffee shop (Coffee Coffee), a local brewery (Saint Archer), and a local surf spot (Beacon’s Beach). Rooms have an upscale feel to them with soft colors and modern design, yet they are grounded by the surf décor and beachside vibe. After a long day of brewery hopping yesterday in San Diego and a mid-morning train ride, you might be ready to chill. Perfect, welcome to Encinitas, land of laid-back beach coves and well-spaced, neatly-groomed, classic-California neighborhoods. And there are breweries to explore, of course. Bier Garden Encinitas: Just a short walk from the train station, Bier Garden Encinitas is a great first stop, an inside-outside beer bar with 32 taps all dedicated to Southern California. Fuel up on one of the specialty burgers while you explore what the chalkboard has to offer. Culture Brewing: Right next door to Bier Garden is Culture Brewing tasting room with 20 of their beers on tap. Saint Archer Brewery: Following the same theme of proximity, adjacent to the Surfhouse Hotel is Saint Archer Brewery. Belly up to try a few, then grab a six-pack to go. Walk down to Beacon’s Beach for the sunset. Consider an early-morning surf at nearby Beacon’s Beach before a mid-morning train to Ventura. Take an Uber to the Solana Train Station just south of Encinitas. Ride the Surfliner train from Solana to Ventura Station, approximately four and a half hours. From the Ventura Station, take a 10-minute Uber ride to the Four Points Ventura Harbor. Enjoy a scenic lunch of fresh fish and clam chowder in the harbor at Brophy Bros. Flanked by Santa Barbara and Los Angeles, Ventura is often overlooked in Southern California. What this means for visitors is a genuine, smalltown feel, hardly commercial, a place where the brewers and bar owners still appreciate your business and take the time to get to know their patrons. Poseidon Brewing: Located on the outskirts of town, Poseidon is a good place to start the evening, logistically speaking. But it’s also a great place to jump right into the depths of the Ventura beer scene. This deep-sea diving themed brewery is perfect for fans of aquatics—you will dig the wormwood tables and underwater theme. Leashless Brewing: Located downtown, Leashless is perhaps the most unique brewery in town because it does what so few other breweries do: It brews organic beer. It sounds fancy, but in reality, it tastes exactly the same as “regular beer,” albeit with organic ingredients and a couple small tweaks to the brewing process. Fluid State Beer Garden: The last stop of the night features one of mankind’s most revered, classic combinations, something everyone from college students to old-timers can get behind: pizza and beer. Fluid State opened last year and is now one of the staples of downtown Ventura. Pop in for a pizza and a couple local Ventura brews. Take the Surfliner from the Ventura Train Station to Santa Barbara, approximately one hour. 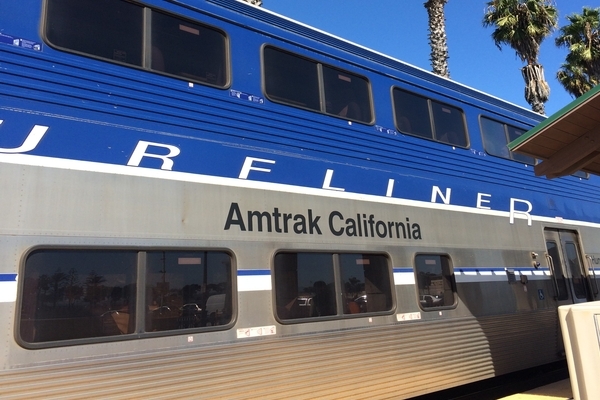 Do your best to get a coastal-side seat, as this section of the train ride is one of the most scenic as it hugs the coast and provides views of the Channel Islands throughout Ventura and Santa Barbara counties. If you haven’t been to Santa Barbara in a while, you might be surprised by the new development that’s taken place around the train station. This includes newish hotels, like the Hotel Indigo. Alternatively, go for one of the classic beachside inns on Cabrillo Blvd, like the West Beach Inn, for easy access to the shoreline walking path. Santa Barbara’s beauty will make it difficult to belly up indoors. But a new funky neighborhood also beckons to be explored. The Funk Zone: Santa Barbara’s newest, most hipster-oriented neighborhood is called the Funk Zone, filled with wine tasting rooms, breweries, bistros, and art galleries. If you blow through Bass Bear Brewing, Figueroa Mountain Brewing, Lama Dog Tap Room, and Topa Topa Brewing and still want more, go check out Pure Order and Third Window. Spend the morning enjoying the scenery around Cabrillo Blvd. Take the Coast Starlight Train from Santa Barbara to San Luis Obispo, approximately three hours. Once again, this ride will be incredibly scenic as you pass through the coastal mountains. This one is an easy choice because you can stay at a brewery. Check out the lofts above SLO Brew. As a county, San Luis Obispo has it all—rolling hills and mountains, harbors and beachfront communities—some say it’s where cowboys meet surfers. As a city, though, San Luis Obispo (shortened to SLO) is more of a complete town than you’d expect. Set back about 10 miles inland from the coast, there’s a lot of focus on urban development. This is good news for brew fans, as there are a lot of options: Central Coast, Tap It, Libertine, Bang the Drum, Dunbar Brewing, SLO Brew, Barrelhouse and more. Consider taking a tour with Hop on Beer to sort through it all. Spend the morning exploring the town of San Luis Obispo. Take the Coast Starlight Train to Paso Robles, approximately one hour. One of Paso’s most charming layouts is its enormous, historic city park. All around are shops, bars, apartments, and restaurants, and it helps retain the old-school, small-town atmosphere. Check out the brand-new dwellings from Paso Robles Vacation Rentals. For a region dominated by wine, the beer scene in Paso will surprise you. As a first-time visitor, checking out the pioneers of this region, Firestone Walker Brewing, is a must. From there, explore the new local breweries that have followed. Toro Creek Brewing: Owner Brendan Cosgrove grows his own hops, so trying out Toro Creek’s Pale Ales and IPAs are a great place to start. The tap room is one of grace, described by Cosgrove as an “elegant farm” atmosphere. Think soft colors, antique furniture, a record player, air plants, and dried hops hung overhead to complete the harvest vibe. Earth and Fire Brewing: As one of Paso’s local hangouts, Earth and Fire is worth a stop to sample a flight. Try the Chocolate stout on a chilly evening. Silva Brewing: If you like industrial layouts and attitudes, you’ll dig the vibe at Silva Brewing—a product of Chuck Silva, former brewer at Green Flash. Here, the taproom exists alongside the brewery, allowing you a peek into the process. A good local secret: Pop out the back door of the brewery and find yourself directly inside the Pour House, a lively craft beer bar.